Hi everyone! I’ve missed blogging so much. I’ve been so busy the past weeks with the move and with organizing and tidying up of our new room that I haven’t had enough time to squeeze in blogging in my time sched. By the way, have I told you that we were moving? I guess I haven’t. Anyhoo, we did move and it’s been a crazy couple of weeks for yours truly. Also, I haven’t been in the blogging mood during my past downtime, so please forgive me for the lack of posts on here. 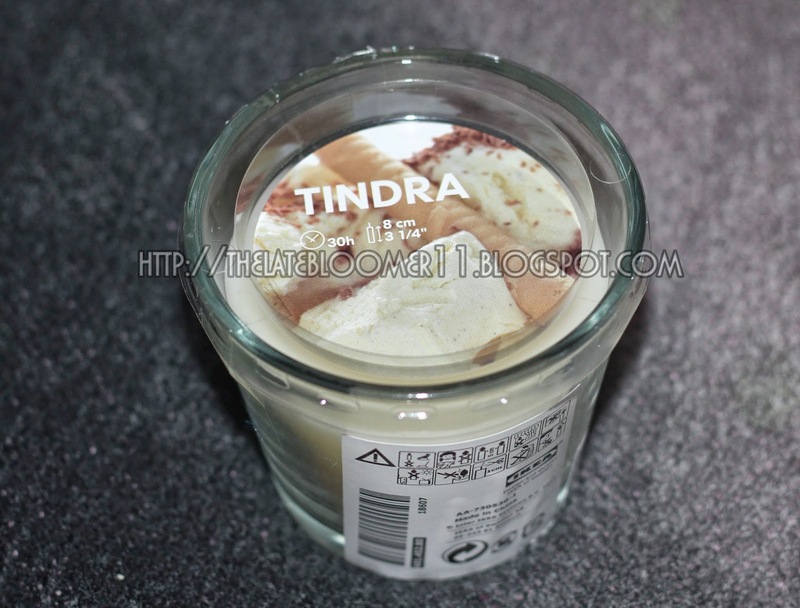 Now that I’ve made that part about my absence clear, let me share with you my new found love: IKEA Tindra ScentedCandles! Every time I watch beauty gurus’ hauls on YouTube where they show their newly purchased Bath & Body Works Candles, I always want to roll into my cocoon of envy. Why? 'Coz I’ve always wanted to be able to do that, too – do what? Purchase and light scented candles in our bedroom. Whenever I see a video where a beautiful candle is lit, I always imagine of how nice it would be to be able to smell that scent and have our room smelling flowers or cupcakes or donuts or whatever scent I want. So, imagine my exuberance when I found these hidden jewels at IKEA when we went there to purchase pillows and other necessities for our new room. I smelled them and I knew right there and then that we’re not leaving IKEA without at least one candle in our cart. After all, it just costs less than S$2 that day coz it's on sale. But even if it's not, I think it normally costs S$4 something only. What a steal, right?! Super affordable and delightfully-smelling candles! How can you go wrong with that? And here they are now! 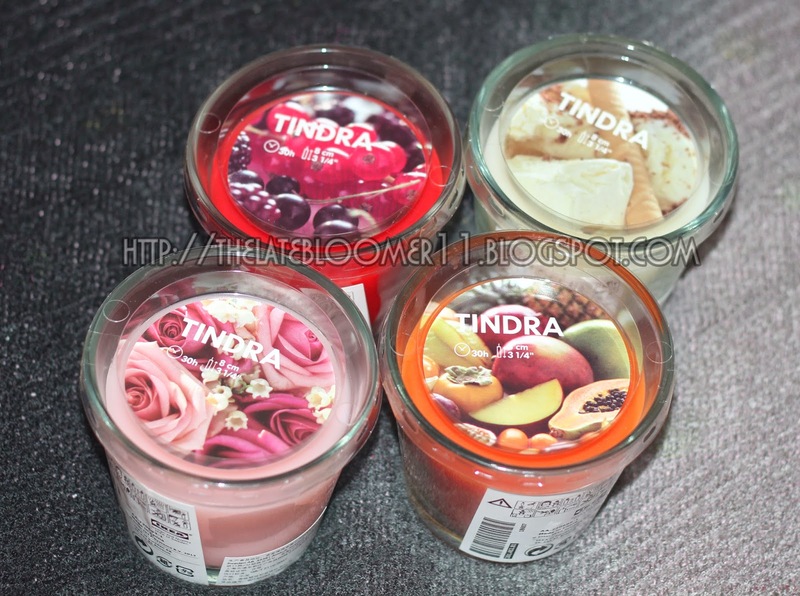 The only thing I hope Tindra did was to at least name each of these candles. I mean, yeah there’s a picture that could basically describe and tell you what the scent would be. But wouldn’t it be so much better if they at least have a name? Anyhoo, I guess I can just let that slide and just think that a precious find for an obviously pocket-friendly price is not that easy to come by, so, no biggie! And oh! Just so you know, Bath & Body Works is now here in Singapore! They opened their 3000 sq ft shop at B2-42 (The Shoppes at Marina Bay Sands). 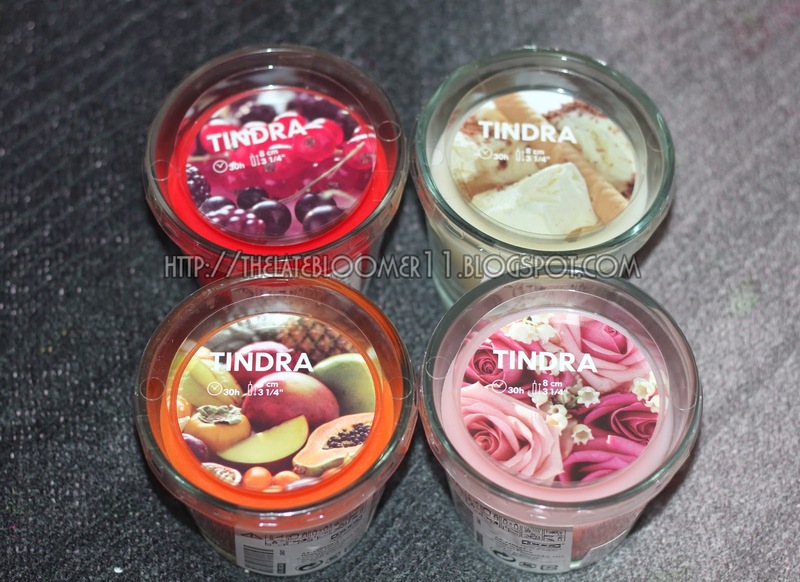 With that said, I think I’d still stock up on these TINDRA scented candles when I finish them all just because they smell really good for such a low cost. Have you tried any of these candles from IKEA? Which one is your favorite? I’m excited to know! Wow such a beautiful Scentsy warmer you have posted. Pink color is my favourite one thing is clear that no one can stop their selves by liking this post and also the video is very lovely. One day I was surfing internet at that time I found a site where beautiful Scentsy warmer and gifts are available in affordable price If you want to buy scentsy products like Scentsy Wickless Candles, gift and many more then you can go through this site. I smelled them and I knew right there and then that we’re not leaving IKEA without at least one candle in our cart. After all, it just costs less than S$2 that day coz it's on sale.